We love Japanese food and I made some attempts to prepare a few favorite dishes at home, but without success. It took several trials before the hubby was pleased - yes, he's my greatest (and most brutal) critic! =) But who else would give me an honest feedback, right. Over the years, my kitchen churned out good and bad versions of katsudon, kani salad, chicken teriyaki, gyudon, yakitori, among others. Of course, I've failed and succeeded too with J's fave Japanese hot pot dish - sukiyaki. As you know, I don't usually measure ingredients when cooking. I need to test and repeat the procedure at home, measure the ingredients and jot down the quantity and steps. Then, I decide to share on the blog when I am satisfied. That's what happened to this sukiyaki. With it's many versions over the past few years, I was not able to share it with you, even if it's just a very simple and easy-to-do dish. Promise, it's really fast and easy. Even kids can do this (save for the chopping part). Here's the sukiyaki I've been cooking occasionally, based on a YouTube video by a Japanese couple, which I cannot find anymore. I just made my version with readily available ingredients. There are two ways to cook sukiyaki -- one is to sear and season beef first, while the Eastern Japanese way is just boil the broth and dump everything in. That's what I do - dump everything. =) What will take a bit of time is the preparation and adjusting the taste of the broth. But it cooks in just 10 minutes, tops! *Adjust the amount of meat and vegetables according to your preferences. These are just my estimates. Add more or less of each kind. 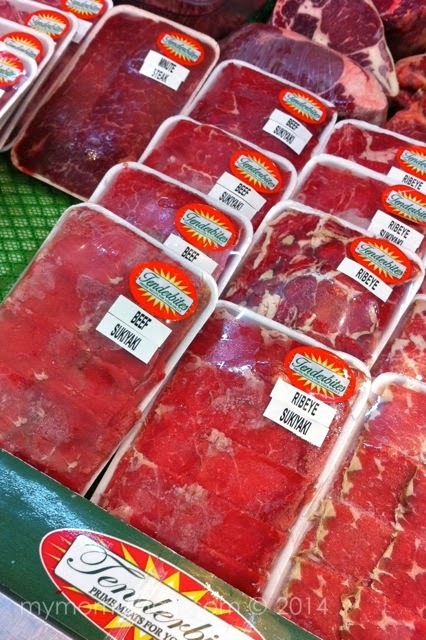 Loosen/separate meat slices so they don't lump together when cooked. Soak vermicelli noodles in water to soften it. While soaking noodles, cut all veggies, tofu, mushrooms, and set aside. Then drain noodles. In a sauté pan or skillet, heat all liquids and bring to a boil for about a minute or two. This will allow alcohol from sake to dissipate. Lower heat to simmer. Add sugar and dissolve. 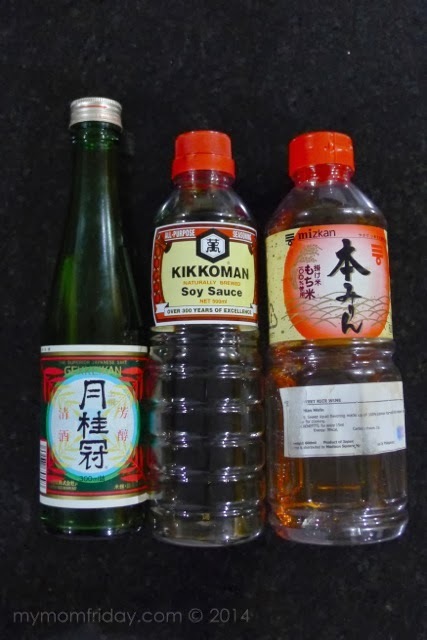 * Add Kikkoman and sugar by the tablespoon as needed. Some may prefer more salty, while others want the broth more sweet like we do. Once satisfied with the taste of the broth, place noodles in center. Cover and cook for about 2 minutes in boiling broth. Then place each topping side by side. Do not mix. Instead, ladle some broth over everything to spread the flavor, then cover. Tip: Better to make broth a little bit salty/sweet since the flavor will be absorbed by the meat and veggies. You can always add boiling water anytime if taste is too strong for you. If broth is lightly flavored, it might be bland after everything is cooked in it. Crack an egg in each bowl (to whoever wants one). The boiling heat from the sukiyaki will half-cook the egg when poured over it. Traditional Japanese style is to dip the sukiyaki in beaten egg then eat. 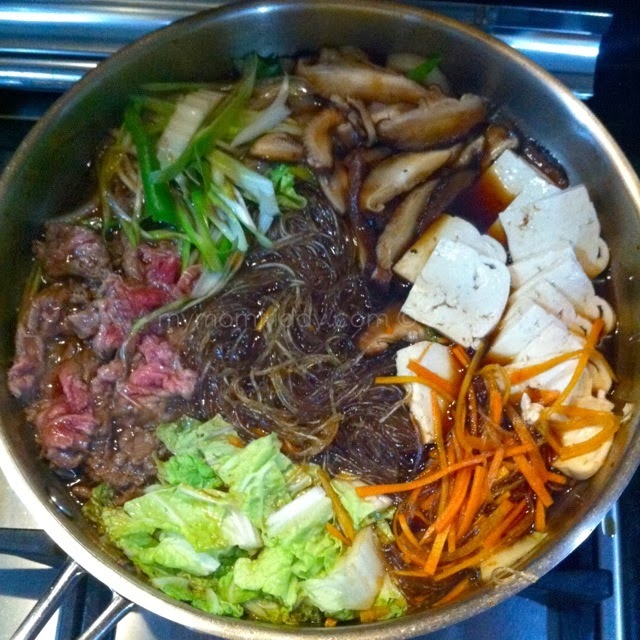 Serve the sukiyaki immediately in the center of the table, straight from the pan. 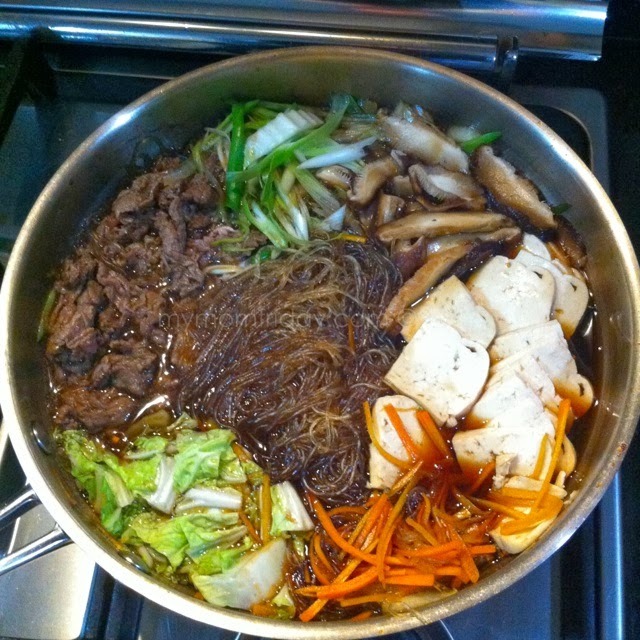 Or if you have a portable single-burner, you can set and cook on-the-spot since sukiyaki is a hot pot dish. There were times when my ingredients were not complete, like missing the mushrooms or tofu... but it's still okay. Photos show I was missing the enoki mushrooms! Pick and choose what you want to add or remove, or lessen. But this is my basic combination to give a more flavorful broth. I still need to perfect my broth, so I hope you find the right amount of seasoning and flavor to your liking.